The RED ZONE cast is complete. The final cast member to be announced is… DRUM ROLL PLEASE! 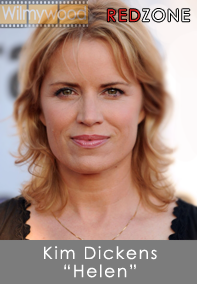 Congrats to Kim Dickens! This lovely southern girl has been seen on the big and small screen. You might have seen her as Janette Desautel on HBO’s TREME, as Joanie Stubbs in HBO’s DEADWOOD or as Colette Jane on FX’s SONS OF ANARCHY. In the movie world, she’s been in top notch flicks such as THE BLIND SIDE and coming this October she plays Detective Rhonda Boney in GONE GIRL. Welcome to Wilmywood Kim! So, who are the stars and what characters do they play? Here’s your complete cast list. And the stars are already enjoying Wilmywood as RED ZONE held it’s first private cast dinner at 1900 Saturday night. The owner Ken Oliver and executive chef Kirsten Mitchell, along with the staff threw down an amazing menu of food and beverage. Director James Foley along with Producers Nikki Toscano and Bill Johnson spent a fun evening meeting and greeting each other in Wilmywood. Some of the cast members enjoyed the evening as well. In attendance was Kevin Rahm, Samantha Mathis, Graham Rogers, Stefanie Scott and David Castro just to name a few. Our sources tell us the cast and producers (especially Nikki) completely fell in love with the place and the food. However, that is just another day for Ken Oliver: delicious perfection. Ken hosted the Tammy cast several times last year and they gushed over the food and atmosphere as well. Today is officially day one of production. They will shooting in the Forest Hills area. Welcome to Wilmywood, RED ZONE peeps! THE WILMYWOOD DAILY – 03/17/2014 Under the Dome, Red Zone, The Longest Ride, Catherine Hardwicke and more.